Some magazines/publishers create mood boards to describe what they’re looking for, others write out themes. This theme happens to exactly match what I designed, so I’m hopeful. We shall see! The Fiasco already claimed this one for himself, which is appropriate since he does look rather dashing in it. I guess I’ll just have to knit another for myself! I like how this pattern knit up in the bulky alpaca, very soft and warm. Also, I kind of think Hawaiian shirts and woolly hats should be a new fashion trend. 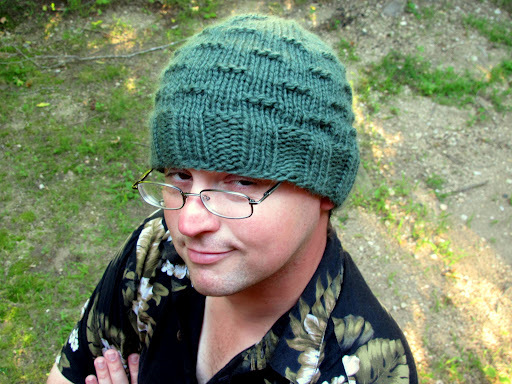 🙂 Somebody else on Ravelry already knitted up their own Giving Comfort hat, which just warms my knitterly soul. 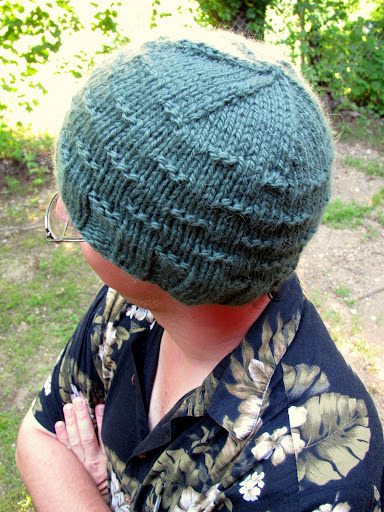 She used two strands of worsted weight yarn held double for her hat because she didn’t have any bulky yarn and it turned out great. I love seeing projects made from my patterns! This weekend I’m heading off to visit family. I haven’t been home in over 6 months, so it will be nice to see everybody. I think I’ll bring my Color Affection shawl for take-along-knitting, it’s great for travel because the rows are long and easy. I’m looking forward to making some progress. I also need to bring my spindles since nobody at home has seen me spin yet! Hope you all have lovely weekends! This entry was posted in FO by shoelaceswitcher. Bookmark the permalink. Sorry about knitpicks, but maybe knitscene will work out. I am still trying to decide if I want to try for the Sock Report or not. Have a great weekend! I'm really sorry to hear about Knit Picks, but with over 400 other submissions! I would think that it is really interesting to think about how each of those possible patterns are. I'll definitely have my fingers crossed that the second time will be a charm. You are also really making me want to dig some soft alpaca out of my stash, I wish it wasn't too warm here!